Nick Drake, researcher at the University of Kings College, London "is currently concentrating on past human occupation and climate change in the Sahara concentrating on the evidence provided by lacustrine sediments deposited by giant palaeolakes once located in the large closed basins of the Fezzan (Libya), the Chotts (Tunisia) and the Bodele (Chad). This research is coordinated by the Sahara Megalakes Project." "These Saharan megalakes provide information for furthering our understanding not only of the palaeoclimate of the Sahara but also African biogeography and palaeoanthropology. The Sahara Desert currently provides a formidable barrier to animal and hominid migration from central/southern Africa to Arabia and the Levant. However, there is abundant evidence that on several occasions in the past, creatures which evolved in central/southern Africa were able to populate adjacent landmasses, indicating that this barrier did not always operate in the past. Understanding the long term climatic evolution of the Sahara region is therefore a particularly important question for biogeography and palaeoanthropology. By chance, the catchements of the three megalakes (Lake Megachad, Lake Megafezzan and the Chotts Megalake) link to form a corridor across the Sahara. 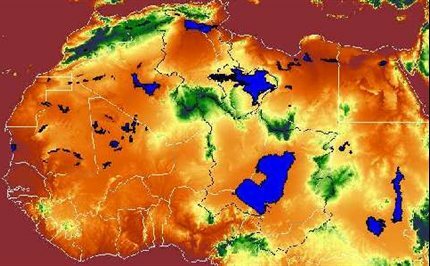 Thus the palaeolake sediments they preserve can be used to determine whether there was previously a corridor of humidity across the Sahara by looking for evidence of synchronous lacustrine activity in all three basins."